Riemann Hypothesis verified until the 1013-th zero. (October 12th 2004), by Xavier Gourdon with the help of Patrick Demichel. Billions of zeros at very large height (around the 1024-th zero) have also been computed. Details can be found in The 1013 first zeros of the riemann zeta function, and zeros computation at very large height. The Riemann Hypothesis (RH) is one the most important unsolved problem in mathematics (see Zeta generalities for details about the RH). It has naturally been numerically checked threw the ages, thanks to techniques about the Zeta functions evaluations (see Numerical evaluation of the Riemann Zeta-function for details). Numerical computations have been made threw the ages to check the RH on the first zeros. Computer age, starting with Turing computations, permitted to perform verification higher than billions of zeros. An history of the RH verification on the first n zeros is given below. Notice that the latest RH verification on the first 1013 zeros have been achieved thanks to the use of the fast Zeta multi-evaluation algorithm by Odlyzko and Schönhage, and that it is the first RH verification done with this technique. Details can be found in . While numerical computations on zeros of the Zeta function have long been focused on RH verification only (to check the RH, isolating the zeros is sufficient so no precise computations of the zeros are needed) it was Odlyzko who the first, computed precisely large consecutive sets of zeros to observe their distribution. More precisely, Odlyzko made some empirical observations of the distribution on the spacing between zeros of z(s) in various zones and checked the correspondence with the GUE hypothesis, which conjectures that normalized spacing between zeros behaves like eigenvalues of random hermitian matrices (see  for more details). In 1987, Odlyzko computed numerically 105 zeros of the Riemann Zeta function between index 1012+1 and 1012+105 to the accuracy of 10-8 and was the first to observe a good agreement with the GUE hypothesis (see ). Later, in order to reach much higher heights, Odlyzko with Schönhage  developed a fast algorithm for multi-evaluation of z(s). After refinements to make this method efficient for practical purposes, Odlyzko was able to compute 70 million zeros at height 1020 in 1989 and then 175 million in 1992 at the same height (see ). Later he reached the height 1021 (see ), and in 2001 he computed ten billion zeros at height 1022 (see ). In a more recent unpublished work in 2002, Odlyzko computed twenty billion zeros at height 1023. The algorithm of Odlyzko and Schönhage to perform efficient multi-evaluation of Zeta function was implemented by Xavier Gourdon and used to check numerically the Riemann Hypothesis on the first 1013 zeros. Details can be found in the following paper. has been reached at gn=1034741742903.35376 (for root index n=4,088,664,936,217), with a value of d � 0.00007025. Non normalized difference between those roots is equal to 0.00001709�. This is the smallest known difference between roots of the Zeta function. Other close roots have been detected while verifying the RH on the first 1013 zeros, but some of them may have been missed since they were computed only when separation of Zeta zeros were made difficult. A (non exhaustive) list of close zeros of Zeta until the 1013-th zeros in excel format can be found here : CloseRoots.xls. Complete statistics between zero of index 100,002 and the 1013-th zeros can be found here : ZetaStatGlobal_1e5_1e13.txt. No particular search or reconvergence was performed to find maximum values of |Z(t)| during the computation. The largest values encountered during evaluation were just recorded, leading to the following table : Maximum values of abs(Z(t)) encountered. Computation of two billion zeros of the Zeta function at each of the height 1013, 1014, �, 1023 and 1024 were done. What follows is a synthetic view of what is contained in the paper paper, where the reader should refer for more details. which under the GUE hypothesis entails that the proportion of dn less than a given small value d is asymptotic to (p2/9) d3 + O(d5). Thus very close pairs of zeros are rare. Previous computations by Odlyzko [16,17,18,19], culminating with the unpublished result of computations at height 1023, were mainly dedicated to the GUE hypothesis empirical verifications. As observed by Odlyzko using different statistics, agreement is very good. Our goal here was to compute some of the statistics observed by Odlyzko relative to the GUE hypothesis, at height at each power of ten from 1013 to 1024. Our statistics, systematically observed at consecutive power-of-ten heights, are also oriented to observe empirically how the distribution of the spacing between zeros of the Zeta function converges to the asymptotic expectation. The statistics here are extracted from the paper paper, with in addition the statistics files generated by our program. Computation was launched on spare time of several machines. Zeros were computed starting roughly from the 10n-th zero for 13 � n � 24. An amount of roughly 2×109 zeros was computed at each height. Physical memory requirement was less than 512 Mo, and in the case of large height (for height 1023 and 1024), an amount of 12 Go of disk space was necessary. Table below gives some indications of timing and the value of R used (see section ). It is to notice that due to the difficulty to have some long spare times on the different computers used, we adapt values of R that is why it is not monotonous. Due also to different capacities of the machines, the amount of used memory were not always identical. Timings are not monotonous also but at least, the table is just here to fix idea about cost. Third and fourth columns relates to offset index, so the value 10n should be added to have the absolute index of first or last zero. First and last zeros are always chosen to be Gram points proved regular with Turing's method (see section ). Additional timing information relates to the efficiency of our implementation, using Odlyzko-Schönhage algorithm, compared to the direct evaluation of the Zeta function using Riemann-Siegel formula (). At height 1024 for example, two third of the total time was spent in the multi-evaluation of F(t) (see section ) and a single evaluation of Zeta using the direct optimized evaluation of Riemann-Siegel formula () (we used it for verification) took 5 % of the total time. So globally, the time needed to compute all the 2×109 zeros at height 1024 in our implementation is approximately equal to 20 evaluations of Zeta using the direct Riemann-Siegel formula. This proves the very high efficiency of the method. To make it readable, the graphic restricts on some family of height N even if the corresponding data were computed at all height. Even if oscillations in the empirical data appear because the sampling size of 2×109 zeros is a bit insufficient, we clearly see a structure in figure 2. First, the form of the difference at each height has a given form, and then, the way this difference decreases with the height can be observed. Figure 1: Probability density of the normalized spacing dn and the GUE prediction, at height 1013. A number of 2×109 zeros have been used to compute empirical density, represented as small circles. 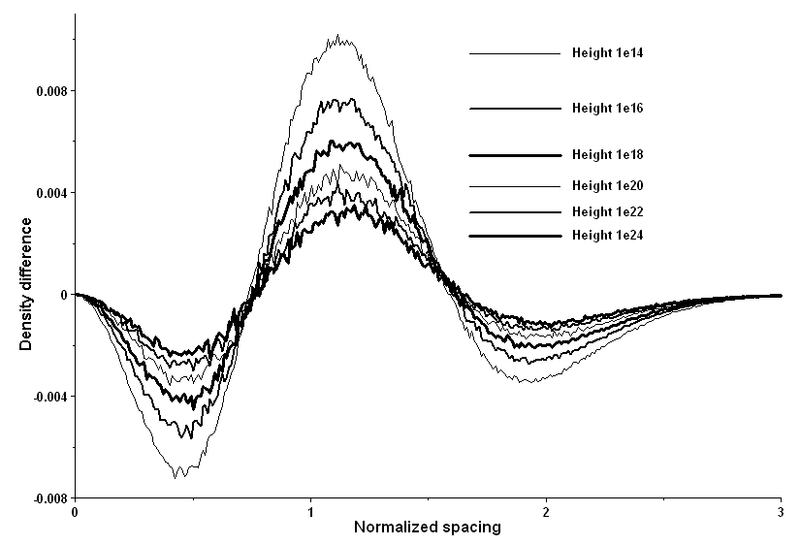 Figure 2: Difference of the probability density of the normalized spacing dn and the GUE prediction, at different height (1014, 1016, 1018, 1020, 1022, 1024). At each height, 2×109 zeros have been used to compute empirical density, and the corresponding points been joined with segment for convenience. The table below lists statistics obtained on violations of Rosser rule (VRR). As we should expect, more and more violations of Rosser rule occurs when the height increases. Special points are Gram points which are counted in a VRR, so equivalently, they are points that do not lie in a regular Gram block. The S(t) function is defined in () and permits to count zeros with formula (). It plays an important role in the study of the zeros of the Zeta function, because it was observed that special phenomenon about the zeta function on the critical line occurs when S(t) is large. For example, Rosser rule holds when |S(t)| < 2 in some range, thus one needs to have larger values of S(t) to find more rare behavior. However, it is thought that the real growth of rate of S(t) is smaller. First, it was proved that unconditionally, the function S(t)/(2p2 loglogt)1/2 is asymptotically normally distributed. So in some sense, the "average" order of S(t) is (loglogt)1/2. As for extreme values of S(t); Montgomery has shown that under the RH, there is an infinite number of values of t tending to infinity so that the order of S(t) is at least (logt/loglogt)1/2. Montgomery also conjectured that this is also an upper bound for S(t). As described in section 4.2.6 with formula (5), the GUE suggests that S(t) might get as large as (logt)1/2 which would contradict this conjecture. As explained in [18,P. 28], one might expect that the average number of changes of sign of S(t) per Gram interval is of order (loglogt)-1/2. This is to be compared with the last column of the table below, which was obtained thanks to the statistics on Gram blocks and violations of Rosser rule. As it is confirmed in heuristic data in the table below, the rate of growth of S(t) is very small. Since exceptions to RH, if any, would probably occur for large values of S(t), we see that one should be able to reach much larger height, not reachable with today's techniques, to find those. As already discussed in section , a certain proportion of zeros were recomputed in another process with different parameters in the implementation and zeros computed twice were compared. Table below list the proportion of twice computed zeros per height, mean value of absolute value of difference and maximal difference. from which we deduce the value of the last column. This would imply that S(t) would get occasionally as large as (logt)1/2, which is in contradiction with Montgomery's conjecture about largest values of S(t), discussed in section 4.2.4.
together with the GUE expectations. The last table below is about mean value of logdn, 1/dn and 1/dn2. The following files contains, in a "brute" form, the global statistics of our computation of two billion non trivial zeros of the Riemann zeta function, at different height (zero number 10n for 13 � n � 24). Each file corresponds to one height, and contains data like Gram blocks, types and number of violations of Rosser rule, extremal values of deltan and dn+dn+1 (dn is the normalized gap between consecutive zeros), data on S(t), moments on dn, and observed distributions on gaps. R. J. Backlund. Uber die nullstellen der Riemannschen zetafunktion. Dissertation, 1916. Helsingfors. R. P. Brent. The first 40,000,000 zeros of z(s) lie on the critical line. Notices of the American Mathematical Society, (24), 1977. R. P. Brent. On the zeros of the Riemann zeta function in the critical strip. Mathematics of Computation, (33):1361-1372, 1979. J. des Cloizeaux and M. L. Mehta. 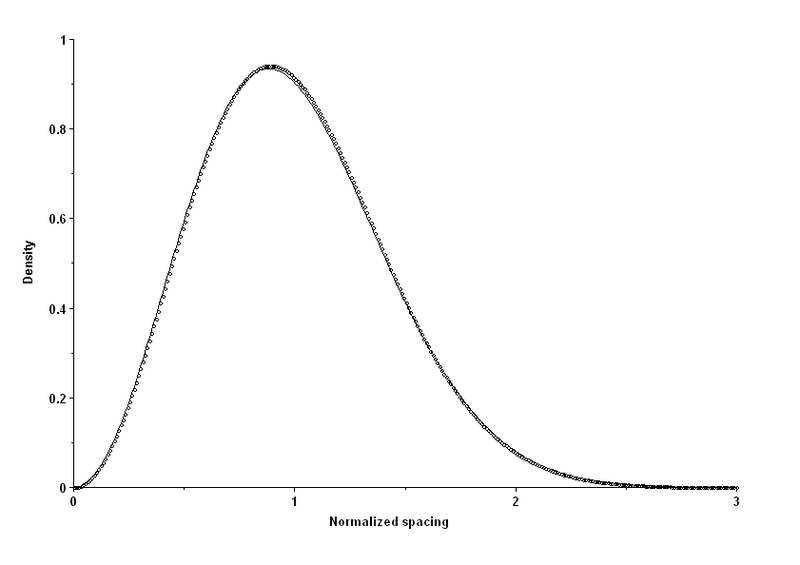 Asymptotic behavior of spacing distributions for the eigenvalues of random matrices. J. Math. Phys., 14:1648-1650, 1973. Xavier Gourdon. The 1013 first zeros of the Riemann zeta function, and zeros computation at very large height. available at http://numbers.computation.free.fr/Constants/Miscellaneous/zetazeros1e13-1e24.pdf, October 2004. J. P. Gram. Note sur les zéros de la fonction de Riemann. Acta Mathematica, (27):289-304, 1903. J. I. Hutchinson. On the roots of the Riemann zeta function. Transactions of the American Mathematical Society, 27(49-60), 1925. H. J. J. te Riele J. van de Lune. On the zeros of the Riemann zeta function in the critical strip. iii. Mathematics of Computation, 41(164):759-767, October 1983. H. J. J. te Riele J. van de Lune and D. T. Winter. On the zeros of the Riemann zeta function in the critical strip. iv. Math. Comp., 46(174):667-681, April 1986. R. S. Leghman. Separation of zeros of the Riemann zeta-function. Mathematics of Computation, (20):523-541, 1966. D. H. Lehmer. Extended computation of the Riemann zeta-function. Mathematika, 3:102-108, 1956. D. H. Lehmer. On the roots of the Riemann zeta-function. Acta Mathematica, (95):291-298, 1956. M. L. Mehta and J. des Cloizeaux. The probabilities for several consecutive eigenvalues of a random matrix. Indian J. Pure Appl. Math., 3:329-351, 1972. N. A. Meller. Computations connected with the check of Riemann�s hypothesis. Doklady Akademii Nauk SSSR, (123):246-248, 1958. H. L. Montgomery. The pair correlation of zeroes of the zeta function. In Analytic Number Theory, volume 24 of Proceedings of Symposia in Pure Mathematics, pages 181-193. AMS, 1973. A. M. Odlyzko. On the distribution of spacings between zeros of the zeta function. Mathematics of Computation, 48:273-308, 1987. A. M. Odlyzko. The 1021-st zero of the Riemann zeta function. note for the informal proceedings of the Sept. 1998 conference on the zeta function at the Edwin Schroedinger Institute in Vienna., Nov. 1988. A. M. Odlyzko. The 1020-th zero of the Riemann zeta function and 175 million of its neighbors. Available at URL= http://www.dtc.umn.edu/~odlyzko/unpublished/index.html, 1992. A. M. Odlyzko. The 1022-th zero of the Riemann zeta function. In M. van Frankenhuysen and M. L. Lapidus, editors, Dynamical, Spectral, and Arithmetic Zeta Functions, number 290 in Contemporary Math. series, pages 139-144. Amer. Math. Soc., 2001. A. M. Odlyzko and A. Schönhage. Fast algorithms for multiple evaluations of the Riemann zeta-function. Trans. Amer. Math. Soc., (309), 1988. J. B. Rosser, J. M. Yohe, and L. Schoenfeld. Rigorous computation and the zeros of the Riemann zeta-function. In Information Processing, number 68 in Proceedings of IFIP Congress, pages 70-76. NH, 1968. E. C. Titchmarsh. The zeros of the Riemann zeta-function. In Proceedings of the Royal Society of London, volume 151, pages 234-255, 1935. C. A. Tracy and H. Widom. Introduction to random matrices. In G. F. Helminck, editor, Geometric and Quantum aspects of integrale systems, volume 424 of Lecture Notes in physics, pages 103-130, Berlin, Heidelberg, 1993. Springer. A. M. Turing. Some calculations of the Riemann zeta-function. In Proceedings of the Royal Society of London, number 3, pages 99-117, 1953. R. P. Brent J. van de Lune H. J. J. te Riele and D. T. Winter. On the zeros of the Riemann zeta function in the critical strip. ii. Mathematics of Computation, 39(160):681-688, October 1982. S. Wedeniwski. Zetagrid - computational verification of the Riemann hypothesis. In Conference in Number Theory in Honour of Professor H.C. Williams, Alberta, Canda, May 2003. On 24 Oct 2004, 22:33.